Balkan food is some of the most complex in Europe. Although firmly rooted in simple peasant cooking, the foods eaten in the Balkans reflect a wide variety of influences over a long period of time: geography and history, ethnicity and religion, wars and invasions, and new ingredients brought from other parts of the world, especially spices from the East and crops from the West. Although there’s no single “Balkan cuisine,” many of the same ingredients and techniques are used in the dishes of the disparate groups who live in there. The mountainous region known as “the Balkans” covers a large part of southeastern Europe, including Albania, Bulgaria, Bosnia-Hercegovina, Kosovo, Macedonia, and Montenegro, as well as parts of Croatia, Slovenia, Serbia, Romania, Greece, and Turkey. (Seven of these countries once belonged to the nation of Yugoslavia, which broke apart in the 1990s.) At least two dozen national and ethnic groups live in this region, where nine languages are spoken and four major religions are practiced (Roman Catholic, Eastern Orthodox, Islam, and Judaism)—all of which makes the Balkans a place of great cultural diversity, with a complicated history. No wonder Balkan cooking encompasses dishes as diverse as casseroles slow-cooked in wood-fired ovens, stuffed vegetables, spicy meats grilled over open fires, fish fried in olive oil, yoghurt and cheeses made from sheep and goats’ milk, flatbreads and puffy breads, and sweets ranging from flaky filo pastries to elegant cream cakes. Over the centuries, ingredients from the Americas have become so widespread in the Balkans that it’s hard to imagine the cuisine without them. Potatoes, tomatoes, pumpkins, peppers, and corn are fundamental to the cooking of this region. 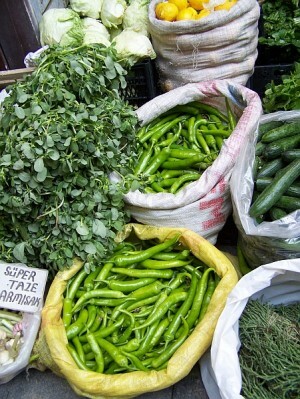 Fresh peppers for sale at a market in Istanbul, Turkey. On my travels through the Balkans, I’ve been especially impressed by the wide array of capsicum peppers grown there. During the pepper harvest in the autumn, the open-air food markets are a riot of color: bright green, red, and yellow bells; deep-red cherry peppers; large tomato peppers from pale yellow and pale green to darkest red; green and scarlet peppers like Anaheims and New Mexicans; yellow Hungarian wax peppers; long curved red and green peppers similar to cayennes; shorter, thicker ones like Italian pepperoncini; and small, thin, pointed dark green and red peppers as flaming hot as those from Thailand. In some parts of the Balkans, ripe red peppers are tied into long strands and hung under the eaves of the houses to dry, much like ristras in the American Southwest. 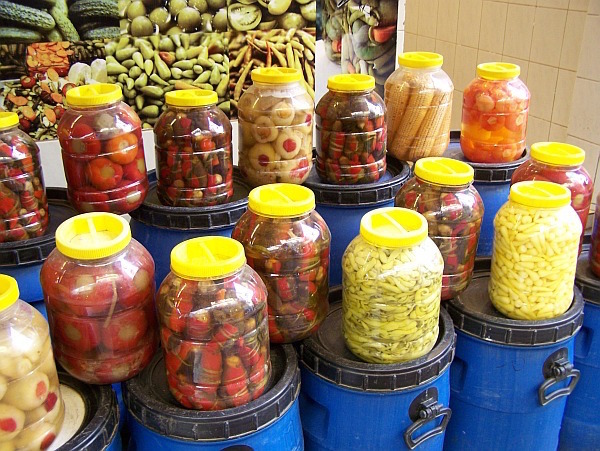 In the Balkans these many types of peppers are eaten fresh or dried, raw or cooked, pickled or milled into paprika. Bell peppers and tomato peppers are baked with herb-seasoned stuffings of rice, meat, beans, or cheese, then garnished with a dollop of yoghurt or sour cream. Long green New Mexico-type peppers are roasted, peeled, and served whole, drizzled with oil and vinegar and sprinkled with chopped fresh garlic. Peppers pop up in salads and meld into casseroles. The hottest peppers are most often found in dishes from areas that were ruled by the Ottoman Turks for several centuries, especially Serbia, Macedonia, Albania, Kosovo, Bosnia, and Bulgaria. Emigrants from the Balkans carried their food traditions with them when they settled in other parts of the world, including northern Europe, the United States, and Canada. And some of them opened Balkan or Yugoslav restaurants in their adopted countries. But most of those restaurants abroad offer a standardized version of dishes with broad appeal to foreign tastes, rather than the rich array of distinctly regional dishes found in the many countries of the Balkans. peppers; čevapčici (che-VAP-chee-chee), spiced ground-meat shaped into little ovals or cylinders, like small sausages; and razniči (RAHZ-nee-chee), cubes of meat threaded onto skewers and cooked over an open fire. 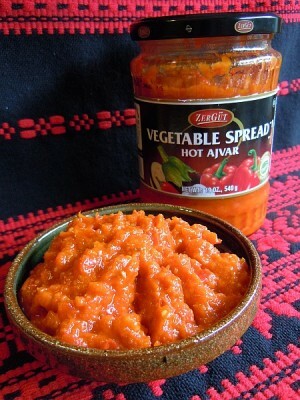 These are often combined on a big “Balkan Platter,” a large serving of mixed grilled meats garnished with chopped fresh onions, hot or mild peppers, and thick kaymak (KAI-mahk, similar to clotted cream), accompanied by ajvar (EYE-var), a bright-red vegetable preserve made of roasted peppers and eggplants cooked with garlic and oil. One of my favorite meat dishes is mučkalica (MOOCH-kah-leet-sa), a colorful pork-and-pepper stew that I discovered in Sarajevo during a trip to (now former) Yugoslavia many years ago. It’s occasionally found on Balkan restaurant menus abroad, although the flavor tends to be too hot-spicy for many foreign palates. But the rich sauce and spicy heat are exactly what I love about this dish! A popular side dish on most Balkan restaurant menus is djuveč (DYOO-vech), a richly seasoned rice-and-vegetable combination that pairs well with grilled, roasted, and pan-fried meats. Made throughout the Balkans—and spelled at least 15 different ways—djuveč is a slow-cooked casserole sometimes containing only a medley of vegetables, but more often with a starch such as rice, potatoes, or pasta added, too. When chunks of meat are included, the djuveč becomes a hearty main-dish casserole. But in most Balkan restaurants abroad, djuveč is usually a simple side dish of paprika-seasoned rice cooked with onions and green beans or peas. Following are five of my favorite recipes for dishes from the countries of former Yugoslavia. 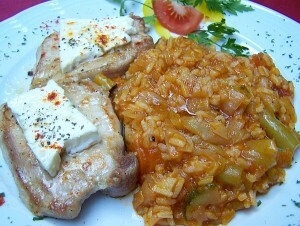 Many of these same dishes are found in other Balkan countries, too, although sometimes with different names. Most of them use Hungarian paprika or New Mexico chile powder as a substitute for Balkan chile powders. Since New Mexico chile powder tastes very similar to the Balkan types, these recipes will give you a true taste of the Balkans on your table at home. Put dried beans into a 6-quart stock pot, add enough cold water to cover them by 2 inches, and soak several hours or overnight. Drain the beans in a colander and rinse them once more with cold water. Put them into the pot with enough cold water to cover them by 1 inch. Stir in bacon, dried hot peppers, 1 teaspoon salt, and bay leaf. Bring the mixture to a boil over medium-high heat. Reduce heat to low and let the beans simmer, partially covered, for 45 minutes, stirring occasionally. While the beans are cooking, heat 2 tablespoons butter in a heavy skillet over medium-high heat. Sauté the onion and carrot pieces together until the onion is soft and golden. Stir in the garlic and sauté for 2 minutes longer. Sprinkle paprika or chile powder over this mixture and cook, stirring constantly, for 1 minute. Immediately remove the skillet from the heat and stir in the tomato paste. After beans have simmered for 45 minutes, stir the onion mixture into them, along with 1 teaspoon salt and 1 teaspoon freshly ground black pepper. 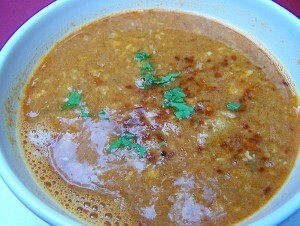 If more liquid is needed, add some water, but do not let the soup become too watery. It should be fairly thick. Let the soup continue to simmer, partially covered, while you prepare the roux (butter-flour mixture). Wipe out the skillet with a paper towel. Melt 2 tablespoons butter in the skillet over medium heat. When the butter begins to foam up, stir in the flour. Reduce heat to medium-low (or lower) and cook, stirring frequently, for about 30 minutes until the roux is a rich caramel color. Don’t let it burn. Remove skillet from the heat.Ladle about 1 cup of hot liquid from the soup into the roux, stir well, then add this mixture to the soup. Simmer the soup, uncovered, for 10 minutes, stirring frequently. The soup should now be very thick. Taste and add more salt and pepper, if desired. Serve hot. Start making this dish at least a couple of hours before you plan to serve it, because it needs to cook very slowly. The flavor is even better if you make it a day in advance and reheat it for serving. *If peppers are large, cut in half crosswise before slicing into strips. Add the remaining 2 tablespoons butter and 2 tablespoons oil to the drippings in the pot, still over medium-high heat. When the fat is hot, sauté the onions over medium heat until soft and golden. Sprinkle flour and paprika over the onions and cook 2 minutes longer, stirring constantly. Turn heat to low. Stir in the pork (and its liquid) and all the peppers. Add meat stock, tomato paste, garlic, salt, and bay leaf, stirring to mix well. (The mixture might seem too dry, but don’t panic and add more liquid. As the peppers cook, they’ll release plenty of moisture.) Increase the heat and bring the mixture to a boil. Then reduce heat to low, cover the pot, and let the mučkalitsa simmer for 1 to 1-1/2 hours, stirring occasionally. Serve hot, accompanied by plain boiled rice or egg noodles. Mix beef, pork, paprika, salt, and pepper in a large bowl until well combined. Add onions, peppers, and garlic, and gently knead them into the meat to make a uniform mixture. Cover and refrigerate for 3 to 6 hours. 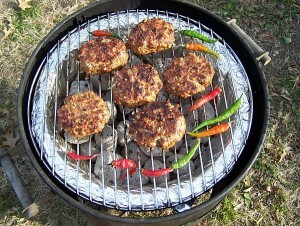 Form the meat into 6 patties, each about 1/2-inch thick. Grill over hot coals 7 to 8 minutes on each side, or until the centers are no longer pink. Garnishes: Coarsely chopped white onions or whole green onion stalks; fresh green or red peppers (mild or hot, whole or chopped); pickled peppers (mild or hot); fresh tomatoes, sliced or coarsely chopped; kaymak (similar to clotted cream), and ajvar (red pepper and eggplant preserve), both of the latter available at many delicatessens and Eastern European grocery stores. Optional: When shaping the meat patties, fill the center of each with 1 rounded tablespoon of feta cheese or finely diced hard cheese such as kashkaval (a firm, salty, aged cheese made from sheep’s milk). Makes 6 meat patties (3 to 6 servings). Heat Scale: Medium. This one-dish casserole is easy to make, and it’s a crowd pleaser at backyard barbecues and potluck dinners. Rice is on the right. Heat olive oil in a 5- or 6-quart Dutch oven (or heavy stovetop/ovenproof casserole) over medium-high heat. When oil is hot, sauté onions and bell peppers until very soft (about 25 minutes). Reduce heat to low and stir in garlic, mild and hot paprika or chile powder, salt, pepper, and thyme. Immediately turn off the heat under the casserole, leaving it on the stove. Start the oven preheating to 350° F.
Stir raw rice into the casserole until all the rice is coated with the seasoned oil. Gently stir in zucchini slices and (optional) peas. Mix together chicken stock, wine, and lemon juice, and pour into the casserole. Stick the bay leaf into the mixture. Arrange tomato slices in an even layer on top of the other ingredients. Cover the casserole tightly and bake at 350° F. for 1 hour. Then uncover the casserole and continue to bake 15 minutes more. Remove the casserole from the oven and stir the tomatoes (on top) into the rice. Serve hot, as an accompaniment to grilled, roasted, or pan-fried meats. Garnish the rice with a sprinkling of crumbled feta cheese over the top, if desired. * Use 8 to 12 large red New Mexico red peppers if available, or substitute 6 very large red bell peppers. Roast whole peppers and eggplants over charcoal or a gas flame, or bake in a preheated 475° F. oven, until the skins are blistered and black. Put peppers in a paper bag and let them steam in their own heat for 10 minutes. Heat 1/2 cup olive oil in a large skillet and cook the onion slowly over medium-low heat until onion pieces are very soft. Add garlic and cook 2 minutes longer. Remove the skillet from the heat and stir in the pepper-eggplant pulp, mixing well. Slowly drizzle the remaining 1/2 to 3/4 cup of oil into the mixture, stirring constantly to incorporate all the oil. Add the lemon juice or vinegar, with salt and pepper to taste. Transfer to a serving bowl and garnish with chopped fresh parsley. Serve as an appetizer to spread on thick slices of country-style white bread or flat pita bread, or use as a condiment to accompany grilled or roasted meats.